Living Reflections (from a dream): South American, here I come! It's interesting how it all becomes a little more final with the buying of a ticket. I've been building up to travelling for ages now - over a year - but only now, when we've finally purchased something definite, do I actually feel like I'm going travelling! Myself, Alan, Welly and Ed went into USIT and waited for what seemed like an eternity before speaking with someone re: South America 2007 - THE TRIP. Disappointment awaited us - we wanted a return trip to Rio, leaving at the end of September. The first available flight to Rio was the end of October, and was pricey. Damn. Thankfully, our helper in USIT, Martha, was a bit of a bleedin' legend, and she managed to hunt and duck and swerve and negotiate and give us some more options. 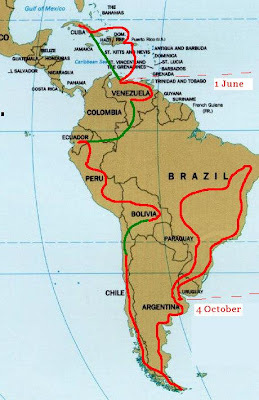 After many false starts, we have now come up with an almost perfect solution - fly into Buenos Aires, and out of Caracas! That way we don't have to double back on ourselves at all, and get to do a circuitous route of the continent. We fly out of Ireland on 4 October, and land in Buenos Aires. Then we're looping up to Brazil for a couple of weeks - so see Rio, etc. - then down, down, down to Patagonia and icebergs and glaciers and moon-land, then up Chile into the Andes, a quick flight from Santiago to La Paz in Bolivia for the Salt Flats and other such wonders, then across Lake Titikaka into Peru for some Inca madness, up into Ecuador for Amazon jungle treks, then we're flying from Quito to Caracas in Venezuela. There, Bones will leave our happy crew for Ireland on March 26th, but we will continue onwards into Cuba and the Caribbean for another two months - happy days - and then back into Caracas to fly home on 1 June. Myself and Bones made the trip into town on Monday, and payed it all off. So it's official! I'm too thrilled to even think about it properly. Mainly, I'm concerned about getting money together. If Al wants to come home, and then fly straight back out again to either North America and Canada, or China and South East Asia, then I'll need some serious moolah. Which means a loan. Which means a headache! But besides all that, I'm going to South America!!! Even I'm getting excited, and I'm getting the death sentence in 70 days' time!